The submission needs to begin by putting the planning process in context. The timing of the Auckland Regional Parks management plan variation in respect to Te Muri, coinciding as it does with the regional parks 50th anniversary, presents Auckland Council with an historic opportunity to demonstrate it understands that the world being planned for today is very different from that in 1966, when Aucklanders were enjoying their first summer’s access to Wenderholm Beach. In the mid-1960s, the Master Transportation Plan for Metropolitan Aucklandincorrectly rendered as Auckland Transport Masterplan, when article published was basking in its first decade of supremacy in ensuring that regional transport was all about road transport. It was the end of the line for rail and light rail—petrol-powered cars, and diesel-powered trucks and buses were the future, and the more miles that could be driven without leaving the motorway the better. And this was the world in which Auckland’s regional parks network was conceived and born, with the 30 March 1965 purchase of Wenderholm. As if the Auckland Regional Parks 50th anniversary, marked by the opening of Wenderholm to its public on 18 December wasn’t sufficient cause to consider the needs of the next 50 years when planning Te Muri’s development, the Paris Agreement, the culmination of 23 years of climate talks one week earlier certainly is. But what was always obvious about Paris, regardless of how many of the 195 participating states sign, much less ratify the climate agreement, is that it will mean nothing if it results in little more than an acceleration in the uptake of electric cars and roof-top photovoltaic panels—a patently inadequate response, and one with negligible potential to avert dangerous global warming. We need to stop building towns and cities on the self-fulfilling assumption people will travel by car. There is no future in which humans can sit down all day without paying an enormous health price. Aside from climate action necessarily being the existential priority consideration of every planning and policy decision that is now made, as Walker and Bosehans allude the only intervention that has been found to be significant in responding to the developed and developing world’s epidemic of noncommunicable diseases is the prioritising of public transport. It seems that the few extra steps that users of public transport a required to make bestow a slew of cascading health benefits. 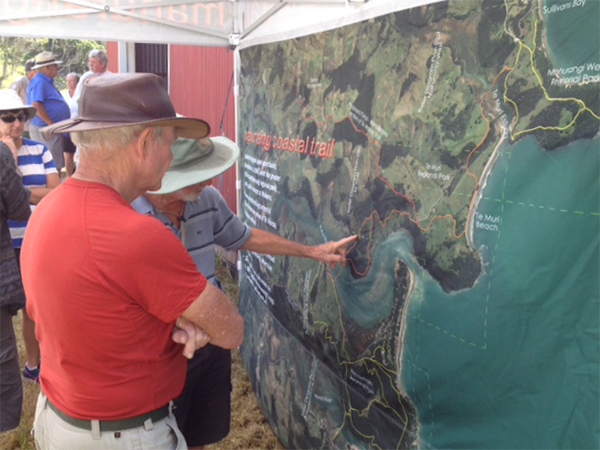 The imperative to plan for the entirety of the greater Mahurangi regional park estate. Before descending into the detail of the Mahurangi Action submission, much less its responses to the specifics of the draft plan, the six aforementioned contextual considerations will be briefly expanded, beginning with the Paris Agreement and its implications for the Auckland region. Mahurangi Action members, and readers generally, are warmly invited to comment on the draft submission, during its gestation.